This entry was posted in Genotype-by-sequencing at BGI and tagged BGI oyster, ftp, olympia oyster, Ostrea lurida, SRA on 20 March, 2017 by kubu4. 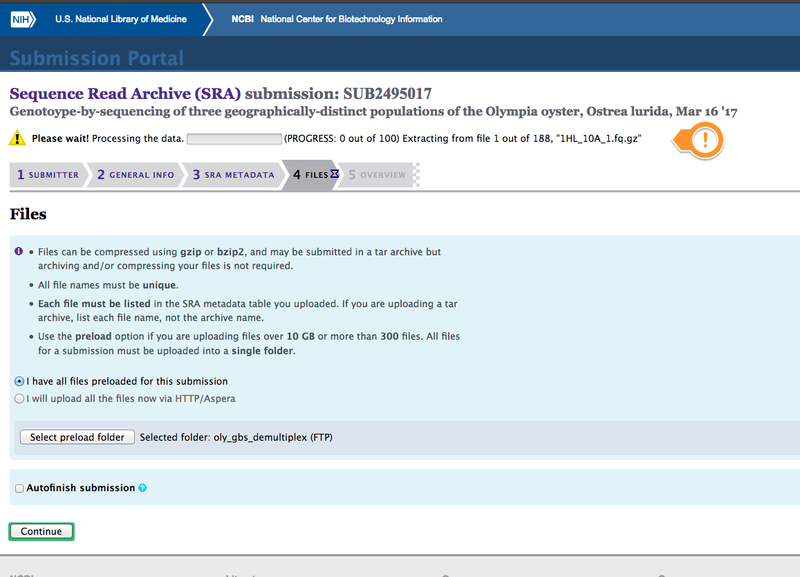 This entry was posted in Genotype-by-sequencing at BGI, SRA Submissions and tagged ncbi, olympia oyster, Ostrea lurida, PRJNA371817, SRA, SRP099079, SRS1964845, SRX2545968 on 8 February, 2017 by kubu4. 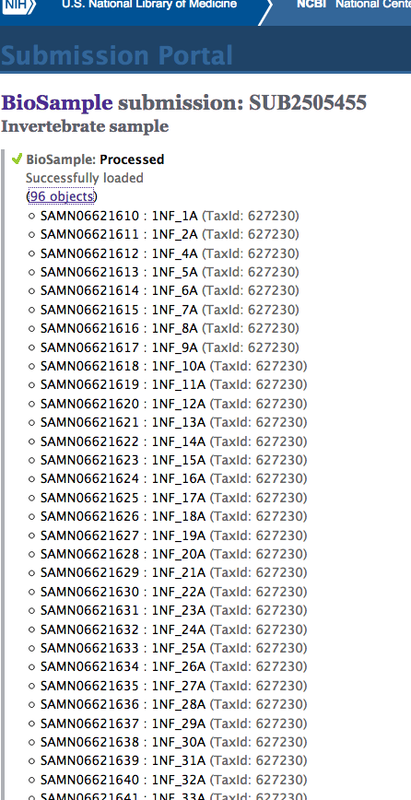 This entry was posted in Protein expression profiles during sexual maturation in Geoduck, SRA Submissions and tagged geoduck, Panopea generosa, PRJNA316216, SRA, SRP072283, SRX1659865, SRX1659866 on 28 April, 2016 by kubu4. 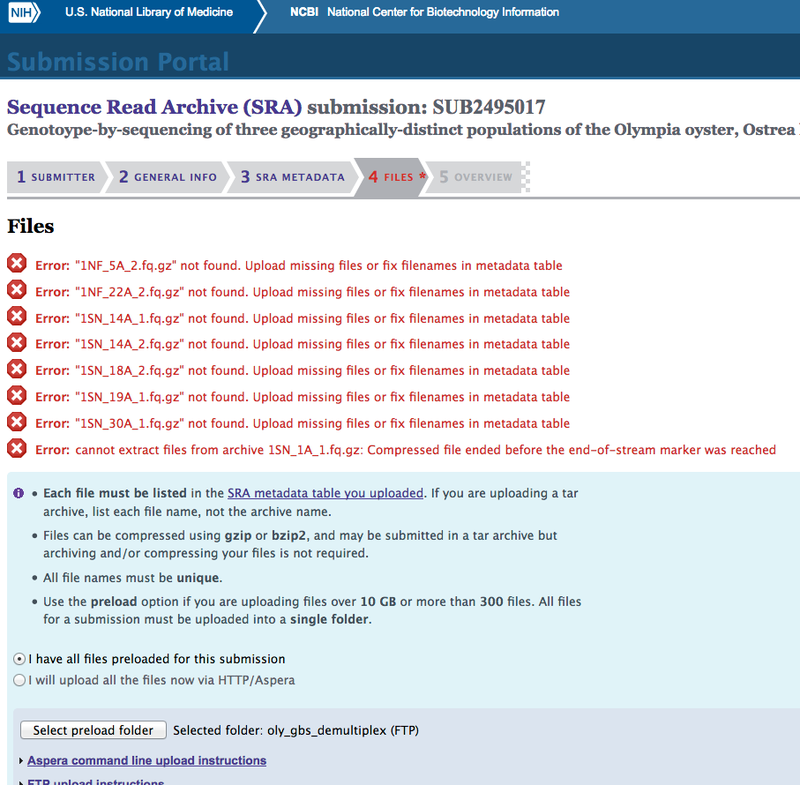 This entry was posted in Olympia Oyster Genome Sequencing, SRA Submissions and tagged ncbi, olympia oyster, Ostrea lurida, PRJNA316624, SAMN04588827, SRA, SRP072461, SRS1365663, SRX1667397, SRX1667398, SRX1667399, SRX1667400, SRX1667401, SRX1667402 on 28 March, 2016 by kubu4. 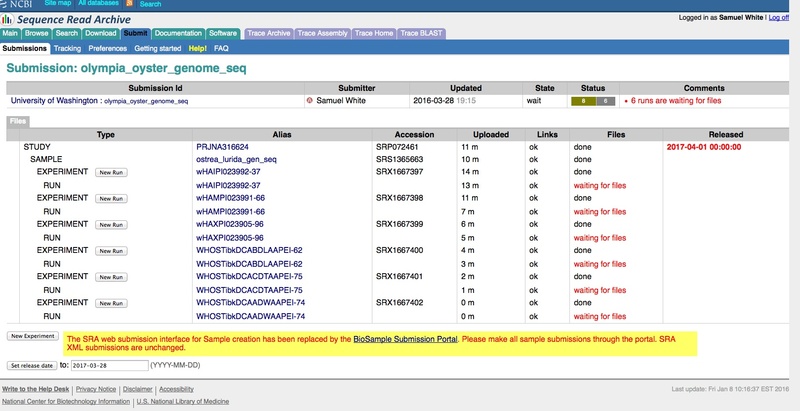 This entry was posted in Geoduck Genome Sequencing, SRA Submissions and tagged geoduck, ncbi, Panopea generosa, SRA, SRP072453 on 28 March, 2016 by kubu4. This entry was posted in Protein expression profiles during sexual maturation in Geoduck and tagged geoduck, ncbi, Panopea generosa, SRA, SRP072283 on 24 March, 2016 by kubu4.